The season of comfort food is upon us and it’s time to get your cast iron skillets, crock pot (slow cooker), stock pots and roasters out! This time of year, when summer comes to a close and cooler weather starts to set in, we tend to spend the weekends watching college and pro football, with our favorite comfort food to keep us company. There is something soothing and consoling about eating pasta, rice, savory sauces, cornbread, soups, chili, pot-roast, oxtails and homemade pies and cakes! It also requires extra workouts for all the indulging that takes place over the next few months. This time of year also signifies traditions, passing down recipes, family cooking lessons and lots of photos to document our time together. 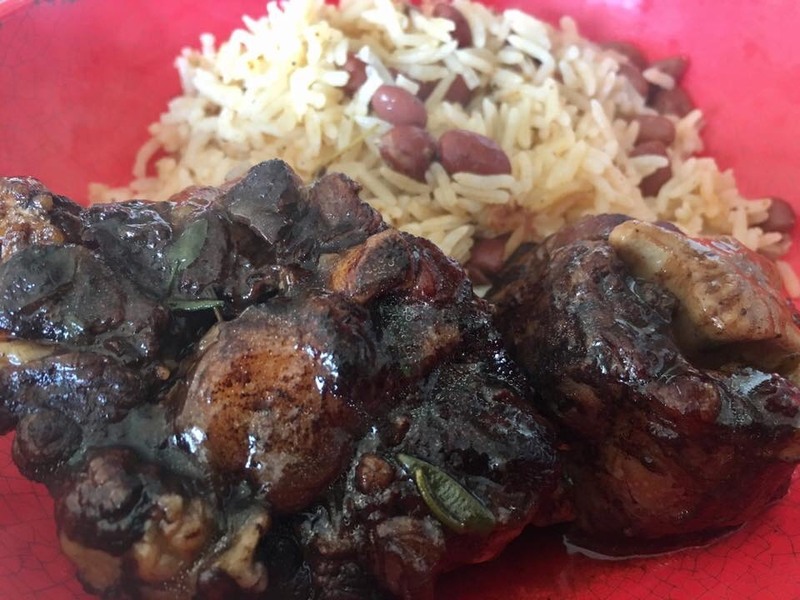 This week, I’m sharing one of my favorite meals, oxtails with rice n peas. It’s spicy, savory, tender, tasty, flavorful and filling. This is not a 15 - 20 minute recipe, however, once it’s finished cooking, I hope this meal brings you comfort as you prepare for the change of season! This recipe takes about 3-3.5 hours, but it’s well worth your time! You can add jerk seasoning to oxtails or put in pot as recipe suggests. I use Walkerswood products, however, Grace is another option. You can choose hot n spicy or mild jerk seasoning. Use 2 - 3Tbs of jerk seasoning in the pot or place on the oxtails. Purchase premade mix of diced celery, onions and carrots, or cut them up yourself. If you cut yourself, you need 1/4 cup of each. Diced small. In a large pot, spray with non-stick cooking spray, then add 2Tbs oil. Add 1Tbs each of salt, pepper, garlic powder and minced garlic. Add 2 - 3Tbs jerk seasoning and browning. Turn on high heat and add oxtails. Constantly stir until everything is browned. Add celery, carrots and onions. Add broth and enough water until the oxtails are covered. Add 3-4 rosemary twigs and 8-10 vines of thyme. Bring to a boil and then turn to low heat, cover and simmer for 1.5 hours. After 1.5 hours, stir the pot. Check your water. If it looks low, add 1 cup water. Cook for an additional 1.5 - 2 hours. You should only add one cup of water over the course of 3 hours. Make sure the pot is always covered. If you want oxtails with more heat, cut the stem off a habanero pepper and add the whole pepper to the pot. In a small pot, Use 3 - 4Tbs flour. Add 1/4 cup broth from oxtails pot and whisk until you have a loose paste. Turn on low heat and continue to whisk. Add one cup oxtail broth and whisk until blended. Add an additional cup of oxtail broth and whisk until blended. The gravy will not be thick, but it will be thicker than the broth in the oxtail pot. Pour over oxtails or the rice n peas. I suggest you use a rice cooker. Add 2 cups rice. I used long grain rice, however, you can use whatever you like. Add 1 can of pigeon peas or light pink beans. Rinse juice off the beans then add to the rice. Add 1Tbs of jerk seasoning from the picture on this post. Add 2Tbs of tomato paste. Add 1 can coconut milk and beef broth or broth from oxtails. You want a total of 32 ounces of liquid for rice n peas. Stir until everything is blended. Add 8-10 vines of thyme.